The current Burnaby Mountain demonstrations and civil disobedience over Kinder Morgan's proposed pipeline expansion has developed into a perfect storm of activism. You have three powerful First Nations; you have location, your local politicians, academics, the young, the old, and David Suzuki and his grandson. 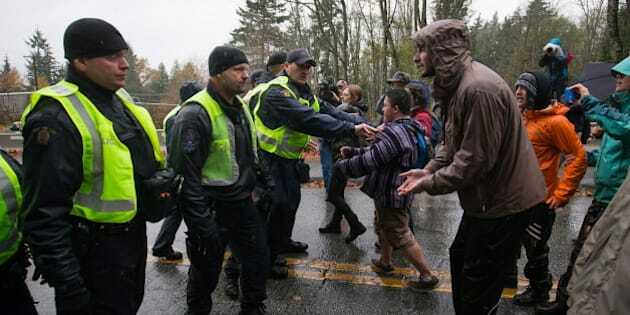 The current Burnaby Mountain demonstrations and civil disobedience over Kinder Morgan's proposed pipeline expansion has developed into a perfect storm of activism. To begin with, the area is shared territory of three powerful First Nations; Musqueam, Squamish and Tsleil-Wauthuth; with an abundance of articulate and charismatic spokespersons, who are united in their opposition to the Texas-based oil companies plans. Then you have location: the outskirts of Vancouver, activist headquarters for Western Canada, where you'll find enviros, community organizers, agitators, inciters,you name it, who no doubt appreciate a worthy issue so near at hand. As well, Vancouver is the mass media centre for the province; all the major print, radio and TV media have their headquarters there, who might not worry so much about their carbon footprint, but nonetheless appreciate the fact that the location is just so damn convenient. On the federal level, you have Burnaby-Douglas MP Kennedy Stewart, an NDPer ready to go at the Harper government's petro-state aspirations. Missing in action is Burnaby North MLA Richard Lee, a B.C. Liberal who might have good reason to lie low since his government favours such tarsands oil projects. You have academics: Simon Fraser University's Lynn Quarmby and Stephen Collis, one a professor of biochemistry, the other a literature professor. Both are outspoken in their opposition and now facing Kinder Morgan's full legal wrath. You have the young, the old, local residents, and David Suzuki and his grandson, and now his daughter and grandaughter, all together on the frontline. Oh, yeah, you also have recent history of a nasty oil pipeline rupture within Burnaby city limits, involving ... wait for it ... the very same company at the centre of this controversy: Kinder Morgan! So there you have it; a perfect storm... but, wait, there's more! Perhaps more so than the B.C. activism of the '90s, centering on forests and forest policy -- the so-called "War of the Woods" which garnered nationwide, if not worldwide attention -- the larger, overarching issue now on Burnaby Mountain is arguably much more galvanizing; fossil fuels in an oil-addicted society. It certainly has traction worldwide, in particular in regard to to the most pertinent element of the fossil fuel issue: climate change. Who's not talking about climate change these days? So what is the possible aftermath of this perfect storm? Looking back at the '90s activism, again, you might wonder, what was the outcome of the War of the Woods? And what relevance, or more precisely, what lessons are to be gained from Clayoquot Sound, and elsewhere, in regard to a possible outcome from Burnaby Mountain? Joe Foy, national campaign director for the Wilderness Committee, and a veteran of the B.C. enviro wars, says it's about "building community" and "building consensus" for positive outcomes. Gains were made in the '90s, protected areas were won and wider legitimacy given to the notion of aboriginal title and rights. But, at the end of the day, Foy maintains, the War of the Woods never really ended. It is "ongoing" which might sum up what is to come from Burnaby Mountain: gains might be made, but the struggle for a truly sustainable society will continue on.